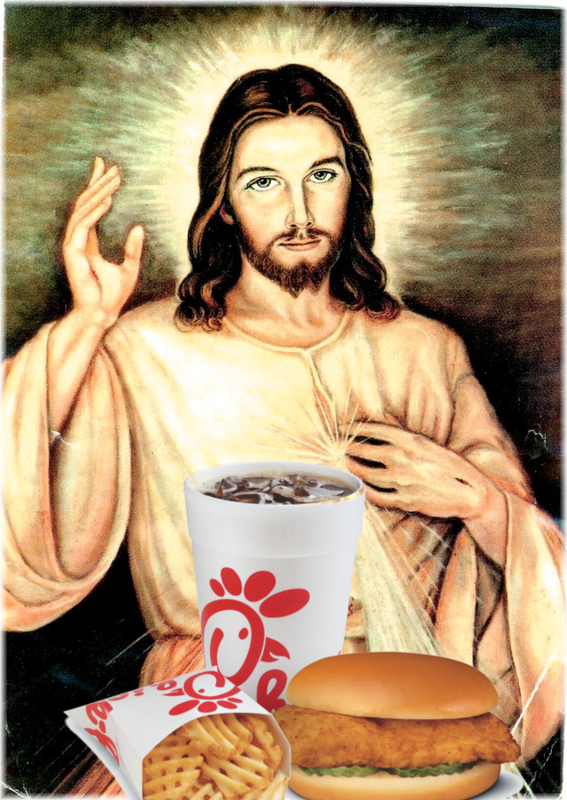 SAN NARCISO, Calif. (Bennington Vale Evening Transcript) -- Chick-fil-A, a fast food restaurant chain specializing in chicken entrées and Christian values, is offering a free breakfast entrée between September 6 and September 10 for those who qualify by registering with the company’s online reservation system. Unfortunately, the system is leaving some with more reservations than it is generating. Complaints have also arisen about the “limited” number of spaces as well as the geographic restrictions. While communities such as Bennington Vale offer more Chick-fil-A locations than they do Starbucks, cities such as San Francisco have none at all, requiring devout patrons to travel as far as Fairfield, Calif. -- a pilgrimage of nearly 50 miles. According to Hollywell’s analysis, franchise owners in the Castro District relocated to Fairfield shortly after setting up shop, amid fears of class action suits from local residents. Locations in Palo Alto and Menlo Park were closed as well, after franchise owners tired of dealing with unusually heavy volumes of customer complaints. “Apparently, advertising ‘soul food’ in those parts of the city had led to accusations of false advertising,” Hollywell admitted. Beyond some customers’ frustrations with trying to find restaurants participating in the promotion, Chick-fil-A has received criticism about the limited number of reservations available and the questionnaire being used to quality those reservations. Hollywell defended the limit as a simple matter of logistics and commerce. It’s not the first time the company has come under fire for not having enough food on hand. Despite clarifications from Chick-fil-A, Hollywell and others have refused to comment on the controversy surrounding the questions contained in the online reservation form. 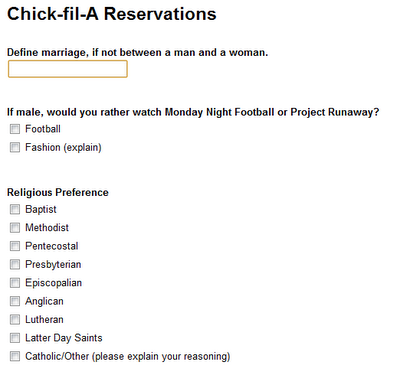 In addition to completing basic requests for dates, times, store locations and contact information, the form includes a survey that Chick-fil-A has described as standard marketing research. 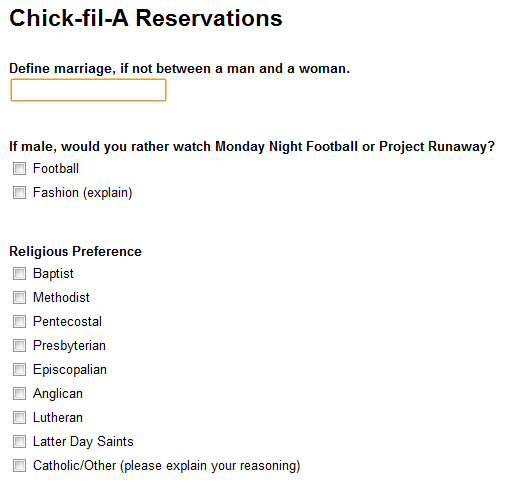 But even some supporters of Chick-fil-A confess that the questions, out of context, can be taken the wrong way. An image of the survey follows. Follow up: As of this posting, the ACLU informed The Bennington Vale Evening Transcript that a Los Angeles man filed a complaint that the “Enter Word Verification Here” box displayed the phrase “berngayesinnr,” which he took as a derogatory and homophobic message. Chick-fil-A’s web designers, however, explained that their verification system relies on a random letter generation process, with any interpretations being nothing more than coincidence or a biased reading.